" we escape from a two- dimensional prison by entering a two-dimensional world for a while and returning to another two-dimensional wall. That is why a three dimensional world is spacial . Our four-dimensional time is another substantial dimension but does not allow us to escape from this world." 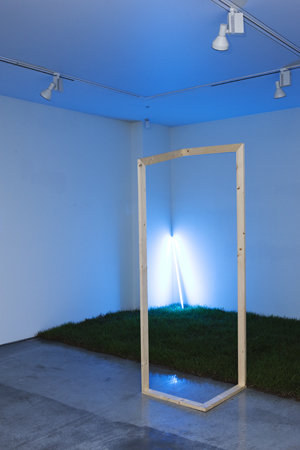 Through a combination of Flatland(2008), whose title is named after Edwin A. Aboott's novel, and Escape, composed of grass and neon, I addresses the contradictory aspect of life, dealing with our oppressed life and human instincts toward freedom. 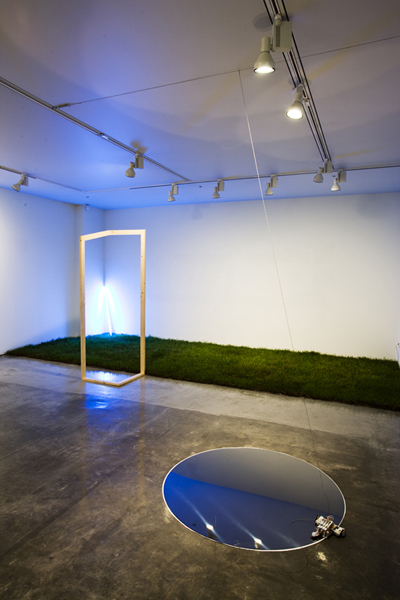 of contemporary humans and is a medium that forms a three-dimensional space when the cube rotates. 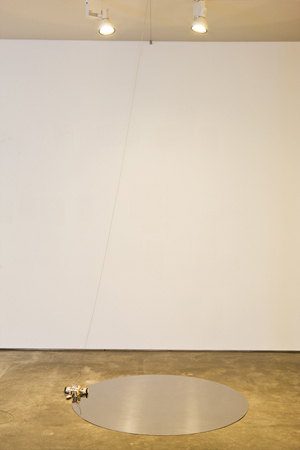 This work ranges from two-dimensional space and thus seems hopeful in that it is not confined to just one dimension. However, it is still restricted by some form of dimension. If not for the passage of time, we humans cannot escape from the structures of technology and capitalism that govern our lives, since we exist in the stream of time in four-dimensional space. Is the possibility to overcome this flow of time desperate, but simutaneously hopeful? 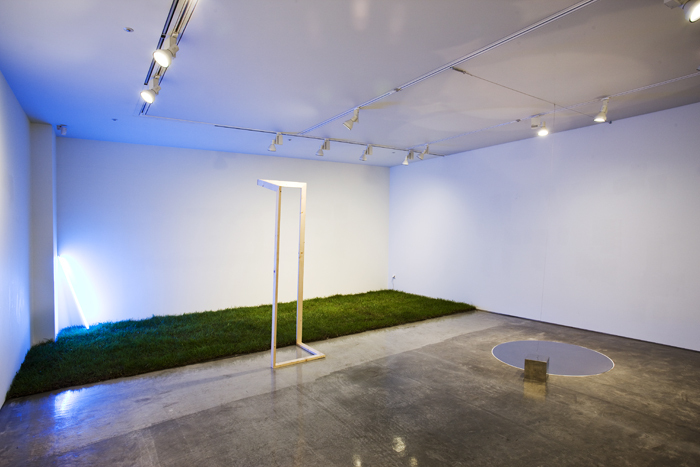 The entrance of Escape set up by Flatland symbolizes freedom from a society oppressed and dominated by a single value and a move to a world of new values. At a glance, this work seems contradictory . "it;s not possible to escape from a completely controlled society. There is no exit. We are living in unrest, exitlessness, and our ideality has vanished into emptiness despaite our ardent wishes. In this crisis where we have entirely lost our humanity, we remain isolated and alienated. AN existential life in which we become the subject is impossible in this society." 3차원의 세계로 잠깐 들어갔다가 2차원의 다른 벽으로 돌아옴으로써 2차원의 감옥을 탈출 할 수 있다. 그러나 이것은 3차원의 세계가 공간적이기 때문이다. 우리의 4차원적인 시간은 비록 그것이 실재하는 또 하나의 차원이긴 하지만 이 세계로부터 탈출하는 걸 허락하지 않는다. 에드윈 A. 에보트의 소설 플랫랜드에서 제목을 따온 이 작업은 억압된 삶의 구조속에서 끊임없이 탈출을 꿈꾸는 인간의 자유본능을 다룬다. 정에 금속줄로 매달려 있는 라인트레이서 센서가 장착된 레고박스는 바닥에 설치된 원형 메탈판(2차원의 도형)의 가장자리선을 따라 끊임없이 돌고 있고(원추라는 3차원의 공간을형성하고 시간이라는 4차원적인 요소도 존재한다) , 또다른 차원의 세계와 매개하는 문은 2차원도 3차원도 아닌 도형이다. 이 설치물안에는 많은 차원들이 공존한다. 하지만 결국 에드윈의 소설의 인용문처럼 우리의 4차원적인 시간은 비록 그것이 실재하는 하나의 차원이긴 하지만 죽음외에는 이 세계로부터 탈출하는 것을허락하지 않는다. 이러한 모순된 세계에서 살고 있는 것은 우리의 모습이자, 나의 모습이기도 하다. 노동과 이익을 위한 유용성이 중심이 되는 이 ‘완전하게 통제된 사회’ 에서 우리는 이 큐브처럼 매일 반복적인 일상으로 살아가고 있다. 자본주의를 지탱하기 위한 생산과 소비의 루틴을 지탱하는 구조와 유일 가치에 의해 지배되는 이 사회로부터의 완전한 자유, 그리고 새로운 가치의 세계로의 이동은 거의 불가능에 가깝다. 우리는 스스로의 욕망, 이상과 우리가 소속된 사회의 구속사이에서 끊임없이 부유한다. Copyright © KIM SINAE. All rights reserved.